How much will my vinyl liner pool cost? You’ve already asked yourself these questions—you know that buying a pool is a big financial decision. You don’t need us to tell you that. River Pools aims to provide you all the information so you can make the best decision in your pool search. We suggest ways to make your pool project more affordable and provide a pricing guide for all three of the major inground pool types. Now we’d like to help you budget by providing an overview of the areas you should take into account when planning your dream backyard pool: the factors for both initial and lifetime costs. When you’re planning your pool budget, you need to take all the spending into account. Nothing’s worse than finding out you accidentally signed up for high maintenance costs you weren’t aware of. Initial cost and lifetime cost are both halves of the money you’ll spend. The initial cost of a pool is what you pay upfront when you buy it—the pool itself, any cool features, and the surrounding area. 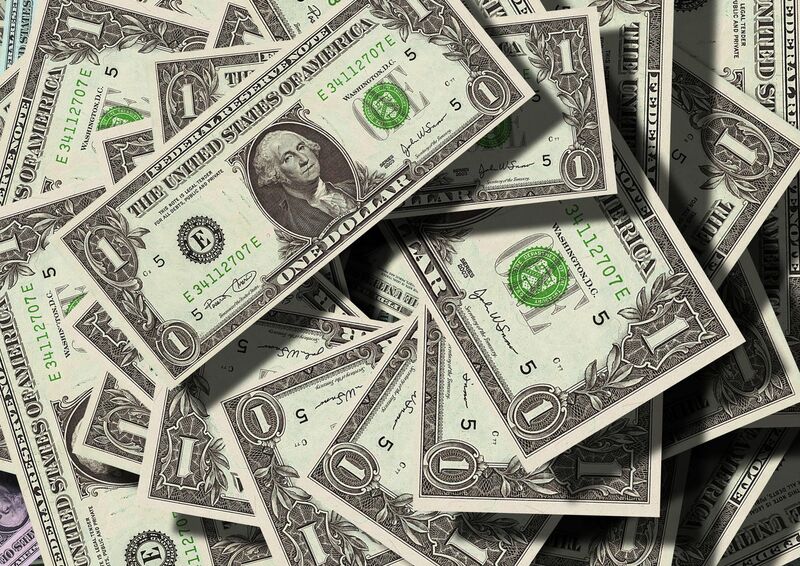 The lifetime cost is what you spend after the purchase—maintenance, repairs, and replacements. It’s easy to forget these follow-up costs, but now you won’t! The average initial cost for an inground vinyl liner pool is $35,000–$65,000. Your area of the country will factor into the price range. A pool in Florida won’t cost the same as a pool in Nebraska. The size (and shape) of the pool affects the initial cost. You pay more per square foot for all the materials that go into constructing the pool. Vinyl liner pools have more freedom than fiberglass pools in terms of shape. However, it’s more expensive with vinyl liner than with concrete. A rectangular shape is easy for the vinyl liner company to cut out for you. A curvy shape is more complicated, especially if you have vinyl over steps as well. Side note: if you want to DIY your vinyl liner pool, you’ll be better off with a rectangular shape because it would be just about impossible to cut a special freeform shape accurately. What’s your goal aesthetic? Pool accessories and landscaping will factor heavily into your budget. A minimalist design will cost less than an all-out Mediterranean-style spa. Unpopular opinion: being cold is terrible. For people, this is (apparently) negotiable, but for pools, it’s a fact. A pool cover will keep your pool in good condition in winter months. Some people also like to have a pool heater or chiller, depending on where you live. Vinyl liners come in a range of thicknesses. The most common options are 20, 25, 27, 28, and 30 mils (thousandths of an inch). You also have the option of embossed or non-embossed. Thinner liners are inexpensive and easier for builders to work with, but they puncture more easily. Thicker liners cost more and are unwieldy, but they provide an extra layer of protection that acts as insurance against dog nails or a stray tree branch. We recommend thicker vinyl liners because of the increased protection from punctures and tears, but you’ll want to look into the pros and cons of thick vs. thin liners to decide what best fits your situation. 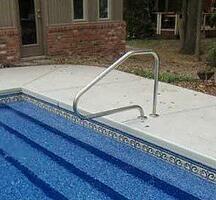 Vinyl liner pools usually have steps that jut out of the main part of the pool. White plastic steps are standard. They bolt onto the pool walls and protrude out from the “body” of the pool itself. It creates a white plastic rim that sticks up above your patio. You can also have a buddy seat built onto the side of the pool. They attach the same way as the steps (bolted to the walls) and provide a bucket seat. You have the option to upgrade to steps built inside the pool, rather than jutting out. These are called “vinyl over” steps because, as you might guess, the vinyl liner comes up, around, and over the steps. The steps take the place of whatever wall panel would have been there. This upgrade can cost $700–$3000 depending on the step design you choose. If your steps are integrated into the bottom of your pool, you’ll have a ladder wrapping over the top of the steps. Coping is the border around the top perimeter of the pool. It provides the transition from the pool to the patio. 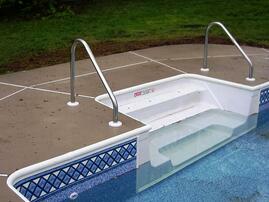 For vinyl liner pools, the standard is white aluminum C-channel coping. The aluminum can be painted different colors, but white is the most common. Side note: you may see coping designated as C-channel or U-channel. 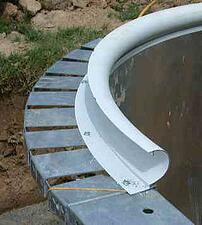 These refer to the same thing: bullnose (or half-round, like a C shape) coping that’s bolted at the top of the pool wall panel as a permanent border for the patio concrete. Cantilevered coping means that the patio concrete is poured up to a styrofoam form at the edge where the pool meets the patio. When the form is removed, though, the concrete itself is the edge (often bullnose as well). Builders use this for concrete pools too. Flat-mount coping isn’t really coping at all. It’s flat and just secures your vinyl liner. You can add different coping, like fancy pavers, on top of it. Wall panels made of metal such as steel and aluminum are stronger and cheaper than polymer (plastic, basically) but corrode in the water. You can upgrade to polymer for no trouble with corrosion, although the panels may bend inward a bit from the pressure of the soil. Doing this project yourself saves $10,000–$15,000. Some people prefer to dig the hole or put down the pool bottom themselves and leave some of the more skilled areas (such as plumbing or electricity) to professionals. Others like to install the entire pool themselves. Depending on your experience level, doing it yourself will probably take longer than a professional construction/installation, and you run the risk of inaccuracy. DIY also reduces your opportunity for a specialty freeform curve because you’d need to cut the liner specifically to fit the fancy design, which would be not only a pain but also near-impossible to do accurately. The process of a DIY vinyl liner pool is basically the same as a professional would do. Select the design and equipment. Install the walls, braces, and floor. Install the vinyl liner and patio. Install the landscaping and fencing. The average vinyl liner will last about 5–9 years. Each replacement will cost about $4,500—paying for the labor and materials to replace the liner, the water to fill the pool, and the chemicals to start the pool back up. Vinyl liner pools require less electricity and fewer chemicals for day-to-day maintenance than concrete pools because they’re less prone to algae. However, algae can still take hold, so you do need the regular upkeep. That maintenance will cost about $7,000 over a 10-year period. That adds up to roughly $11,500 in maintenance over 10 years. How does this budget compare to a fiberglass pool? If on average you replace the liner every 7 years, that becomes $9,000 over the course of 15 years. That alone basically makes up for the difference in initial costs between a vinyl liner pool and a fiberglass pool. Translation: in 15 years, you’ll have spent the same amount of money either way. However, fiberglass pools offer freeform shapes and integrated steps and benches at no additional cost. They include even lower chemical usage, lower maintenance, more durability, and less stress worrying about a dog, tree limb, or storm-swept patio chair tearing the liner. 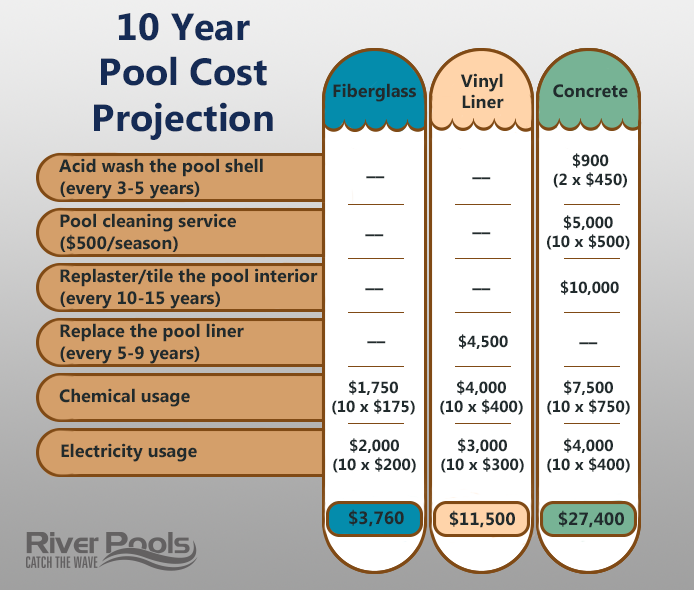 When you take into account all the expenses over 15 years, a fiberglass pool actually costs the same or less than a vinyl liner pool—minus the headache plus more options. And it’s pretty! If you’d like to learn more about the differences between vinyl liner pools and fiberglass pools, you can read about the pros and cons of the pool types. You can also download our free ebook by clicking the button below. Editor's note: This article was updated on October 30, 2018.